Nearly all of today�s PC games are developed using 3D worlds and models, which allow them to be converted into 3D. 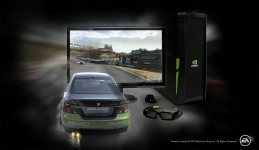 3D takes gaming to the next level of immersion and by working directly with game developers, NVIDIA 3D Vision supported games are automatically converted and look amazing in 3D. One of the most compelling uses of the 3D PC is Hollywood movies. The quality viewing experience on the 3D Vision PC is like no other and introduces the concept of your own personal 3D Movie Theater. A gaming PC with closed-loop liquid-cooling for the CPU in a mini tower chassis. Compact gaming PC with Intel Core i5 and i7 CPUs and NVIDIA GeForce graphics. Extreme performance PC with Intel X299 chipset and NVIDIA GeForce.